« JUST A BIT BLOCKED FOR IDEAS! There is nothing better than making your own Banana Bread, the smell fills every corner of the house and it is the easiest thing to make. I use Macadamia nuts (or you can use walnuts) which compliments this recipe even more. ENJOY!! Confectioner’s sugar – light dusting before serving. Adjust the oven rack to the lower middle position and preheat the oven to 350 degrees. Whisk flour, sugar, baking soda, salt and cinnamon together in a large bowl. 4. In a mixer using the wire attachment whip 2 mashed bananas, melted butter, eggs, yogurt and vanilla. Mix well.. you want a fluffy and creamy banana mixture. 5. In a separate small bowl, mash the remaining 3 bananas so they still have some chunky texture. Then blend together with banana mixture in blender.Slowly fold the whole banana mixture in with the flour until it is combined.. but don’t over mix. Fold in the macadamia nuts. 6. Using a rubber spatula, pour the batter into the buttered loaf pan and smooth the edges and top. 8. Remove and let cool in the pan for 10 minutes. Then place on rack and cool with a cloth towel over the bread for another 30 minutes before serving. 9. To serve, cut into slices and lightly dust with confectioner’s sugar – serve! This entry was posted on August 31, 2010 at 5:11 am and is filed under Uncategorized. You can follow any responses to this entry through the RSS 2.0 feed. You can leave a response, or trackback from your own site. Like the macadamia’s. Ohhhhh …. mouth watering …. Okay take the apostrophe out of the nut…so embarrassing. Yum…and I love it with nuts. Haha! Love the dancing silverware! Thank you for posting this. I love banana bread! You have made me want that banana bread and I want it now. Yummy! I can smell the aroma of it baking! And this is a recipe I might not mess up! I have to buy the yogurt so I’m out of luck for having it NOW! Thank you for sharing. 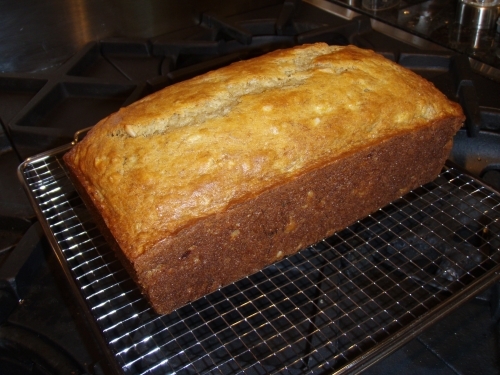 Your loaf looks beautiful, banana bread is something I can make any day; a huge fave in my home. Yummy……..Thanks for sharing the recipe dear. I printed-out this one. Now I might just have to post my baklava recipe. I did you one better and posted TWO recipes! Please let me know how you like them. I’ll be making baklava this weekend.